The UN human rights office (OHCHR) examines the issue of involuntary separation of Korean families from a human rights perspective. The decision to allow scores of people from the Republic of Korea (ROK) to reunite with their relatives north of the border has been welcomed by the UN Secretary-General. The majority of those selected to take part in the week-long inter-Korean family reunion event, which began on Monday, are elderly. Many have not seen each other since the end of the Korean War in 1953. 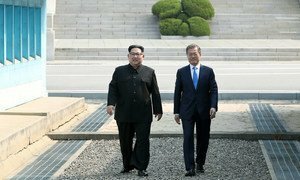 “(The Secretary-General) hopes that such reunion events will become routine and include many more people, including affected Koreans worldwide, allow participants to meet privately, and to remain in contact after the meetings,” his spokesman Stéphane Dujarric said in a statement, issued on Monday evening. The reunions, which are taking place in Mount Kumgang, Democratic People's Republic of Korea (DPRK), are the first to be held since 2015. They stem from the historic summit held in April between the country’s leader, Kim Jong Un, and his ROK counterpart, Moon Jae-in. The UN chief has welcomed the efforts by the two countries to continue their engagement and to take steps to build confidence and trust.